Ghosts have appeared for centuries in theaters as diverse as Elizabethan drama and the Japanese Noh. Old theaters traditionally have a “ghost light,” a lit bulb on the stage after hours, so that nobody—including restless spirits, presumably—will stumble in the vast, dark space. 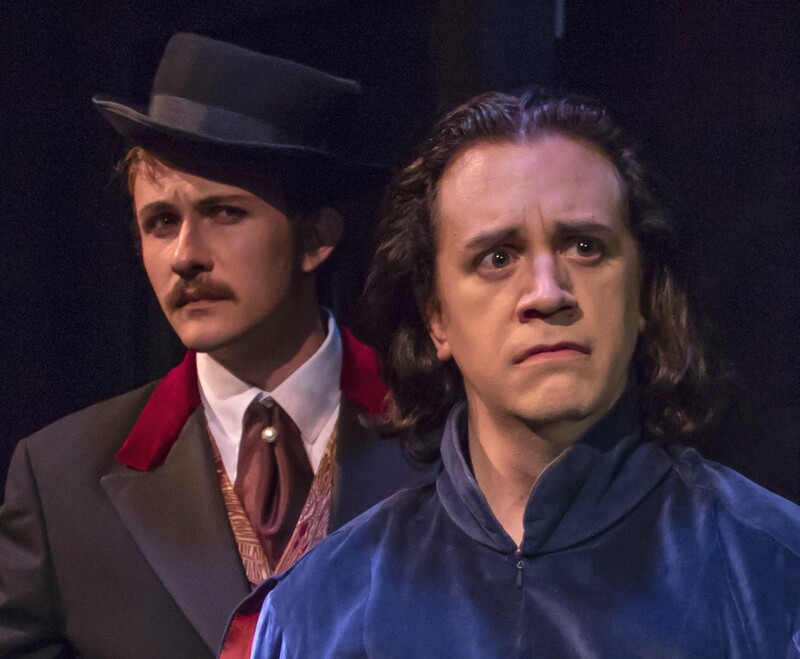 In The Prison Where I Live, the second in Angela Iannone’s series of plays about Edwin Booth, now playing in a production by Theatre Red, we meet two shades from the great actor’s past: his beloved lost wife, who is silent, and his brother, who won’t shut up. If ever there was a great subject for historical drama, it’s Booth. A megastar Shakespearean actor-manager at a time when Shakespeare and the Bible were America’s most commonly-read literature; the heir of a famous theatrical family, and an odd genius with many eccentricities, whose natural delivery contrasted with the grandiloquent acting style of his contemporaries. No stranger to personal tragedy, Booth lost one wife to disease, and a child of a second wife to medical malpractice, which left the mother in a fragile mental state. Oh, and his brother and fellow-actor shot the most revered man of the century, and died, hated and hunted, in a barn set on fire by the soldiers who pursued him. From this historical panoply, Iannone distills a claustrophobic five-person psychodrama: we are trapped with Edwin Booth, essentially in his head, as he grapples with memories, regrets, and artistic paralysis. We find Booth on tour in Chicago, rehearsing for a performance of Richard II and fending off the badgering attentions of his public, his half-mad wife, and his dead brother. The dialog is phrased in diction that recalls the writing style of the period; Iannone’s intensive archival research shows up in myriad details. For instance, John Wilkes’ spirit (played with uncanny resemblance by a rakish Corey Jefferson Hagen) speaks in a Southern drawl, which must, one assumes, have some basis in the historical record. But so far as his political views and ideologies, or what Edwin thought of them, all we see is the again, presumably documented fact that Edwin forbids the mention of his brother’s name, and—in the play’s most harrowing scene—we learn how, one night alone, he burned John’s mementos (theatrical props and costumes) in a basement furnace. 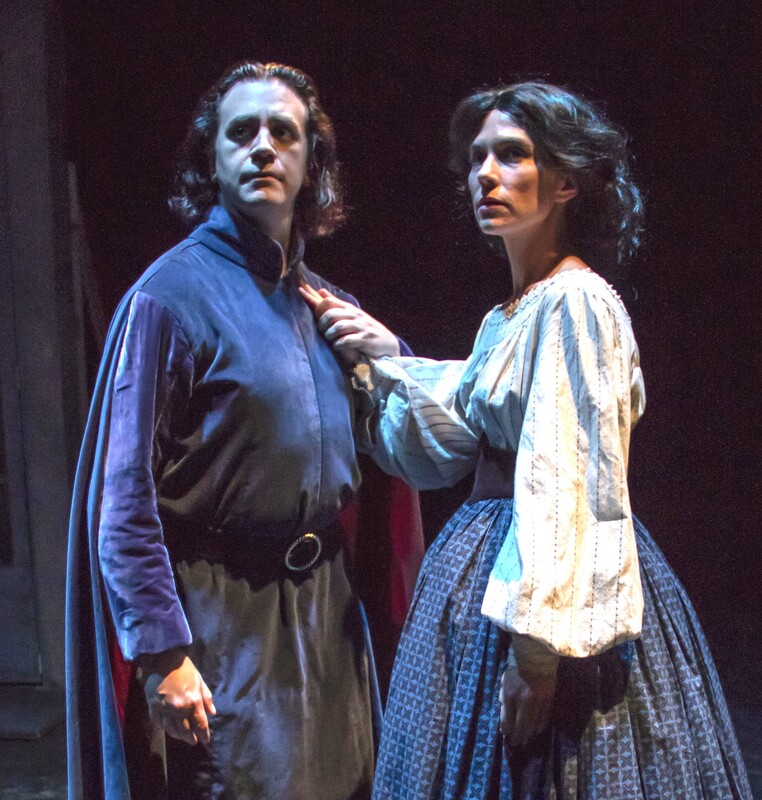 Jared McDaris plays Booth with the advantages of flowing locks, a tragedian’s resonant basso voice, and a contenance that would look perfectly at home on a fifty dollar bill; in the role of the silent specter of his wife Millie, Andrea Burkholder brings a dancer’s grace. As the plot unfolds, we witness a supernatural intervention of sorts, and a reconciliation of the man with his past, in a moment that some may find uncomfortable, but that carries a psychological truth: sometimes the way to deal with ghosts is to bless them and let them go. If we can pull that off, we’re less likely to stumble in the dark.